Anime is a Japanese term for hand-drawn or computer animation. It is very popular and has a large audience over the world. Are you a big fan of Anime and in the search for the best websites to watch free Anime online in English dubbed? Well, there are tons of Anime streaming sites where one can watch dubbed Anime online for free. Having difficulty in finding the best one? You’re at the right place. Here in this article, we will introduce the top 8 best sites to easily watch English dubbed Anime online. Have a look at these dubbed Anime websites and enjoy your favorite Anime shows absolutely free. If you are looking for a simple site that contains high-quality and high-resolution Animes, you will be able to find them all on KissAnime. It is a great website to watch your favorite Anime movies and TV shows. This website provides users with an extensive Anime list for watching Anime series dubbed in English for free. You can locate your favorite Anime series or search for a new one by simply clicking on it from an Alphabets letter. Also, you can find categories such as Action, Cars, Cartoon, Comedy, Dementia, Game, Harem, Historical and more on the left sidebar. It gets updated regularly with all the new episodes. To watch any desired episode, just click on your desired video and enter the captcha, after which you can watch for free. Crunchyroll is an incredibly trusted website where you can easily stream Anime online for free. It has an absolutely huge collection of Anime dub episode with great, top quality videos. Whenever you enter this Anime streaming site, you will be amazed at a number of free content. On the top, the website shows a manga tab you might select to your desired tab i.e., Popular, Joint Promotion, Simulpub, Updated, Alphabetical. Crunchyroll is regularly updated so the most recent episodes will be online as soon as they air on TV. And it is a legal website that available in Free and Premium plans packages. Crunchyroll offers a free trial period for 14 days if you wish to get a Premium Plan package. So go ahead and start watching Anime online in English dubbed. Masterani comes with an incredibly efficient modern user interface, featuring a “torch red” color on top of “pitch black”. It is one of those Anime sites that boast of watching and tracking Anime based upon several categories like Recently Anime, Popular Today, Kids, Short Anime, Being Watched, etc. Also, it provides a helpful search bar on the top which lists a drop-down menu of similar searches. You can search any of desired Anime from the list and and track the latest or trending Anime shows at the current time. Furthermore, Masterani has an increasingly large collection of Anime shows with free English dubbed episode and with respective knowledge of “Ratings”, “Genre”, “Duration” and “Suitable age” for watching that series. Also, this website provides recommendations of several Animes based on your preferences. Funimation is a legal Anime streaming site where users can watch dubbed Anime series online. It has a flat, yet colorful and unique web design which displays an eye-catching tagline, helping the users in viewing the dramas and Animes without any sort of difficulties. This website offers advertisement-free access to an extended Anime library now at a cost of 5.99$ per month. Moreover, it provides ad-free trial to a number of particular shows for 14 days. However, Funimation is a geo-restricted service and not work in all countries. If you are not a citizen of the US and Canada. You will receive the message: “Funimation.com is currently unavailable in your area”. You can easily overcome this issue by using a VPN with a fake USA or Canadian location. If you want to watch English dubbed Anime without any ads or additional features, you should visit AnimeHeaven. It is one of the best online website resources for watching Anime series and movies, both dubbed and subbed versions. This website is regularly updated and contains amazing database of latest episodes and movies. Its interface is simple and user-friendly. You can easily search the Anime you want to watch online using the search box, or you can get the list of Anime based on their categories. And in the menu options, you will see menu items like Anime, Genres, Ongoing, Popular, Dubbed, Movies, etc. 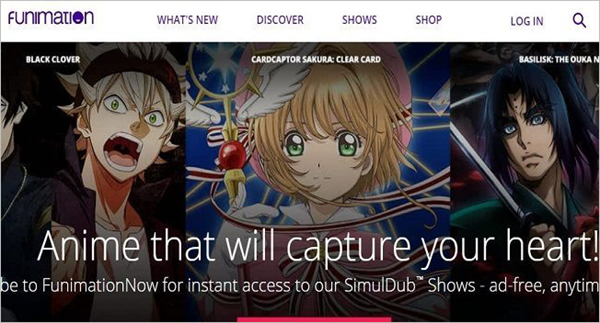 so that you can find your desired Anime without any hassle. Besides, it provides a separate list of dubbed Animes. You can click that option and it will display the complete list of available English dubbed Animes. Animexd is one of the greatest Anime streaming websites that you can watch English dubbed Anime online for free. The layout of this website is incredibly close to being one of the tops. It includes a bunch of Anime series like there Dragon ball 2, One Piece, One Punch Man, Bleach, and much more. As you proceed to scroll down, you can see general categories there like Actions, Adventures, Comedy, Movie, Sport, Magic etc. If you look at the top of the site page, you’ll be able to see some tabs i.e., Anime List, Latest Update, Popular, Cartoon List. You can simply click on any Anime tile and enjoy the episode. Chia-Anime is equipped with the sub-domain “.tv” and usually websites with such sub-domain primarily provide featured video content for specific brands or firms. This revolutionary website comes with a classic and mobile user-friendly user interface. You can find a search bar at the top and simply search for your desired anime shows without any hassle. It cleverly provides both old and new Anime series and the best part of this site is that its content can be download on computer or Mobile. Here you can find some of the most popular Anime shows such as “One Piece”, “High School of Dead”, “Naruto Shippuden”, etc. Moreover, Chia-Anime provides specifically different sections of Anime such as Drama, Manga and Dubbed along with a list of the latest Anime movies and shows. There are lots of dubbed Anime streaming sites option to watch Anime in the current world. Here is our list of the top 8 best sites to watch Anime in English dubbed online. Most of these sites are completely free to watch while some required a minimal amount of payment after your free trial gets over. The great thing about these Anime sites is that they all come with various categories. And it doesn’t matter you are using a mobile device, laptop or PC, just visit your favorite site and enjoy watching English dubbed Anime online. Please let us know which website you prefer in the comment section below. If you find this list helpful, please feel free to share it with your friends and other Anime lovers.